The process of architectural work is a lengthy process that relies on planning and constant development to reach the client’s vision. Once a construction site has been engaged, architects will then gather information about the construction site which will all be dependant on the project requirements. There is a possibility that photographs will need to be take in order to survey the site thoroughly. Any issues that may affect the construction regarding the existing planting, water courses and soil type will have to be addressed. It is likely that a confirmation of the detailed process will be done in writing to ensure who knows who is doing what. This is the time when the ball gets rolling as it is the opportunity for the architect’s initial ideas to be presented to the client as receive feedback on those ideas. A floor plan may be offered with some perspective drawings that will give the client an idea of the overall layout and possibly the look and style of the proposition. In this part of the design process, it’s mostly about whether the client is happy about the direction the architect is heading in. Liaising with the client frequently is what helps the project move forward, it is usual for minor disagreements to occur on the detail of the design. This essentially encourages more discussions. By this stage, a clear sense of budget can be distinguished and if any problems will impact the number. It is also an appropriate time to ensure the client and architect are ready to continue with the designs and the drawings. In the third phase of the project, once the concept has come to a mutual agreement, the architect will begin the process of testing and refining ideas that will contribute to the overall shape of the building. It is possible a Quantity Surveyor will be requested to estimate an independent cost. The budget may be discussed again with it relevance to prioritising over cost, time and quality. It can be difficult to visualise the finished building just by referring to an image which is why it is important to ensure that a client understands what is being done. Generally, floor plans, flows, elevations and cut0through section drawing will be provided by architects along with the usual detailed sketches. Towards this stage of the architectural process, a building consent will need to be applied for on behalf of the client, if this hadn’t already been done in the concept stage. For a contract price to be submitted, a builder will need a very detailed proposition about the project. As seen, architecture is a gruelling process that results in truly awe-inspiring buildings and structures. For more information about architecture and the services we offer, please visit our website! The Library of Birmingham has topped the chart for the Riba Stirling Prize 2014! 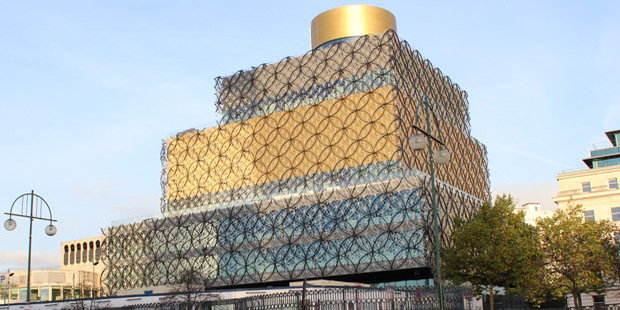 Birmingham’s city folk were being urged to vote for the architectural beauty and the votes payed off with 30% of the votes going to the Library. 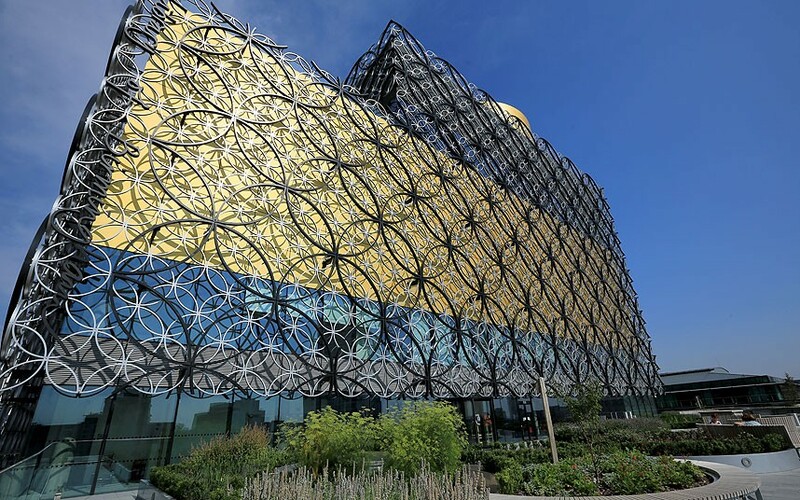 The Library of Birmingham won the Riba Stirling prize on the 16th October 2014. The Library was designed by Mecanoo architect, Patrick Arends, who won the emerging architect of the year. It’s interlocking circle design, rooftop terraces and vast glass-topped central book rotunda are all what added to this gem’s win. Shortlisted along with the Library was London Aquatics Centre, receiving 26% of the votes, London Bridge Tower/The Shard (20%), Everyman Theatre in Liverpool (10%), LSE Student Centre in London (8%), and Manchester School of Art (7%). It was also named West Midland’s overall building of the year, at the regional final. For more news and information about architecture and the services we offer, visit our website! Architecture students have designed a clever way to bring groceries back home – Packtasche (Pack Bag), foldable panniers you can pick up at the checkout. Carrier bags hanging on for dear life off the handle bars of bicycles could well and truly become things of the past, if the solution to carrying groceries home, created by two architecture students in Vienna, gets a wide adoption. 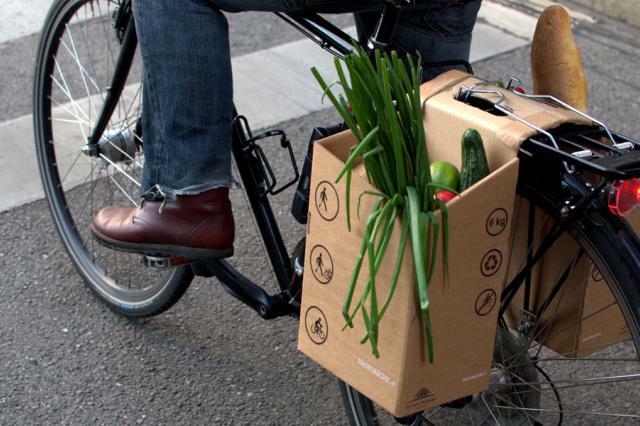 The solution comes in the form a foldable, cardboard pannier, that can be filled with your grocery haul and then placed on your bike. The product, Packtasche, was designed by budding architects, Philipp Moherndl and Matthias Lechner; ideally stores would offer it to customers a replacement of shopping bags and carrier bags. A simple assemble, light in weight and wholly recyclable means that carrier bags could be disappearing, and it also means that shoppers don’t have to worry about whether what they’re purchasing will fit inside their backpack and the weight can be lifted off their shoulders, literally. While many cyclists may be familiar with panniers and may already own one, not everyone fancies the idea of carrying them around all day when they’re not using their bicycles. The designers told an architecture publishing company: “Due to the mass appeal of the bike, conventional cycling accessories do not fit the lifestyle of many urban cyclists. The limited transport capacity of usual bicycles makes shopping difficult and inflexible. The final design incorporates a handle that makes it easy to carry when not travelling on the bike, and once on it, the panniers fit over a rear rack. “Our main goal was to make cycling in the city even more practical and attractive than it already is. The Packtasche is our small contribution to make cycling more attractive to people and hence support sustainable urban mobility,” explained Lechner. The pair are currently hoping to expand their market to Europe and are planing to launch a Kickstarter campaign for their product. What do you think of the Packtasche? 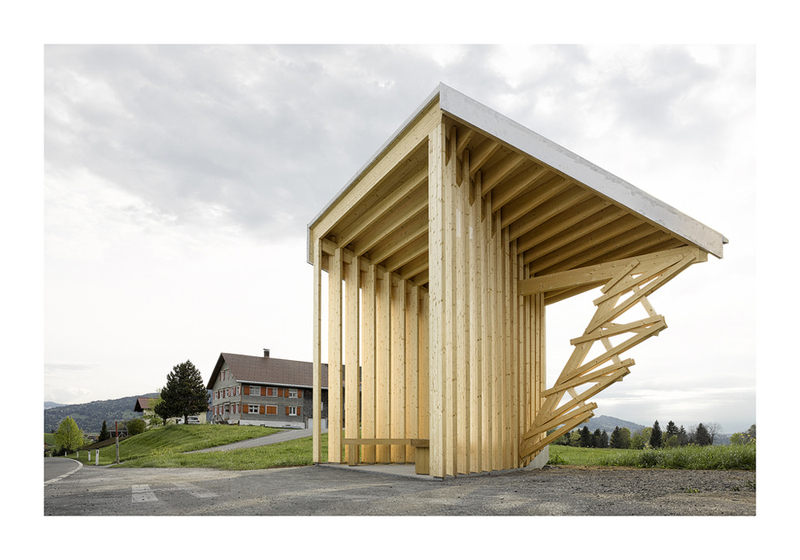 How did a village in Austria make architecture headlines with its bus shelters? 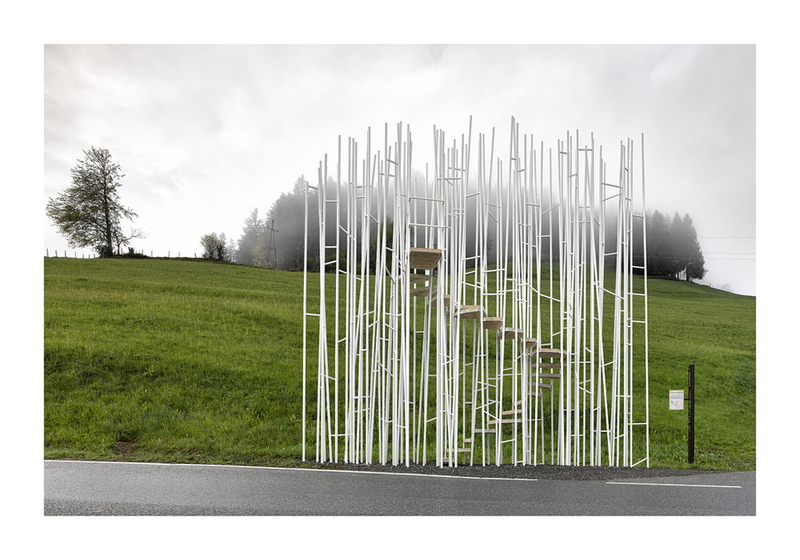 Though it may have seem some form of weird reality, the village of Krumbach in Austria have erected several bus shelters from international architects, putting them into use for all of the village to enjoy. The designs of the bus shelters came from seven different architects, all whom had a different take on just how a bus shelter should be. The architect’s work isn’t exactly out of place as the architectural sector in Austria embraces the world of architecture, as its widespread recognition in the international architecture scene continues to attract over 30,000 visitors annually to its county of Vorarlberg. 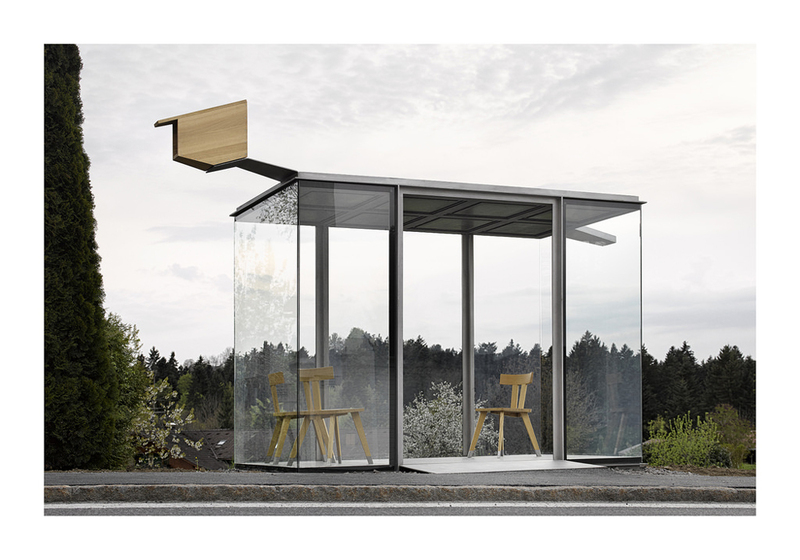 The BUS:STOP Krumbach project decided it was a time for a change, so several international architects all submitted their designs for the prospect of new bus shelters in order to attract more attention to the local area. The village of Krumbach, though small in size, operates a bus service that runs on an hourly basis, which is quite unusual for such a rural area. The 1,000 plus residents of the village all enjoy the operation of transportation, so it was only natural for their attention to be turned to the uncharismatic bus services. In April 2013, architects were invited to visit the village for three days, so they could gain an idea of the local area, the quality of the landscape, the local traditions that would take place, the people and their backgrounds and how the building’s oozed culture from every pore. By summer of 2013, all the architects had given their designs to the village of Krumbach and the selected regional craftspeople started work on the designs, using their specially formed crafting skills to complete the project to its very best. The construction began in the Autumn of 2013 and work continued until just before the opening on 1 May, the 20 regional handcraft businesses that were selected for the projects were all responsible for the transformation of good ideas into works of high quality. The end products were beautiful, as you can tell from the images provided in this blog. What’s your favourite design? Let us know in the comments below. Visit our website for more information on architecture in the UK. The incredibly famous New Street Station is one of the pinpoint attractions for Birmingham. It was first opened in 1854 and has since seen two new rebuilds of the station, one which is currently underway, due to being finished in 2015. 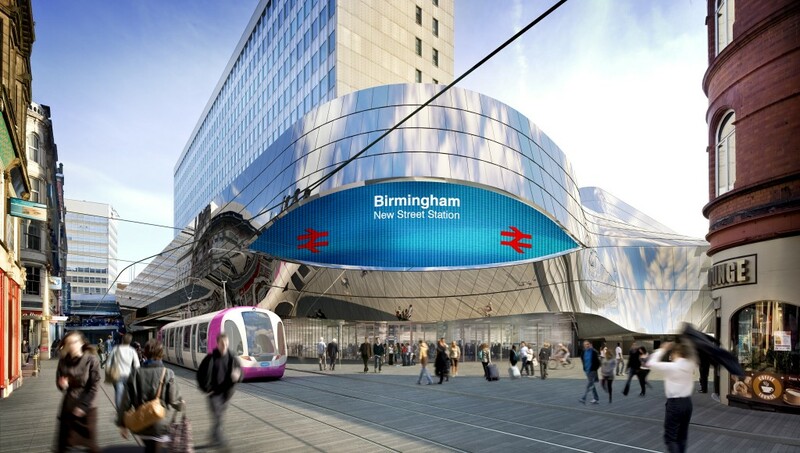 Work began in 2010 on the £600 million pound project that is said to drastically change the way shoppers experience Birmingham and in the 4 years since, measurable changes have been seen around the station. More than 32 million train passengers are estimated to have passed through it in the 2012/2013 calendar year, an all time high for the station. Though the station is said to be undergoing drastic changes, not all involved are seemingly happy with the direction in which it is developing. Initial architects Alejandro Zaero-Polo were the original masterminds behind the shiny design of New Street, but after seemingly differences which are unknown to ourselves, they have resigned from the project. Network Rail have been accused of numerous things since their departure, most notably having pushed through a ‘crass and timid’ design for New Street. AZPML, which has offices in both London and New York, have now been replaced by UK based company Haskoll, who will take control of the plans for the landmark’s central atrium. It is understood that the project’s delivery team, whom is led by contractor MACE in conjunction with Network Rail, has pushed forward a new design for the station, one that is said to change the original plans of continuous white plaster curves for those of tensioned fabric. Network Rail said in a statement: “AZPML was involved in early concept design stages for the interior of the atrium. However we have now chosen to work with Haskoll as interior design architect for the atrium and the Grand Central shopping centre. “There are no plans to change the concept design of the atrium, which will flood Birmingham New Street station with natural light for the first time when completed. With architecture and design applications on a rise by around 14% this year alone it is recorded that this is in fact the ‘Highest on Record’ in the UK. This is due to the fact a total of 13,600 non-EU students have applied for courses starting 2014 in architecture and design, with a further 6,310 applicants applying for architecture courses. Looking for some true inspiration into some of Britain’s best architecture? Here’s a fresh list showcasing Britain’s more modern and traditional architecture. England’s second city, behind London of course, has gone under the knife in the past 20 years or so, hoping to shift the image of an ugly urban jungle to that of a modern metropolis built on class and beauty. Birmingham now boasts some of the finest structures in Europe, but what exactly makes Brum the culture loving city it is? 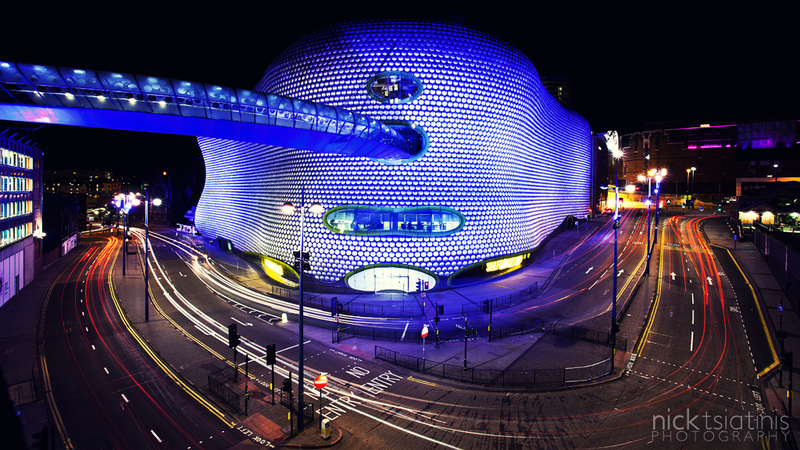 Read on to find out the best of Brum’s architecture. The newest addition to the Birmingham family, the all new Library of Birmingham resides in Centenary Square and regardless of your true opinion (it’s both loved and loathed) you have to admit that it’s a fine piece of architecture. Costing a staggering £189 million, the library boasts the title of biggest public library in Europe, housing over 800,000 books and 200 computers. It’s maybe easier on the eye when up close, yet the library is something of weird beauty. The metalwork is something to behold, linking back to the city’s industrial heritage. There are ten floors of endless joy for the book worms, whilst the library also has capacity for gigs and talks. 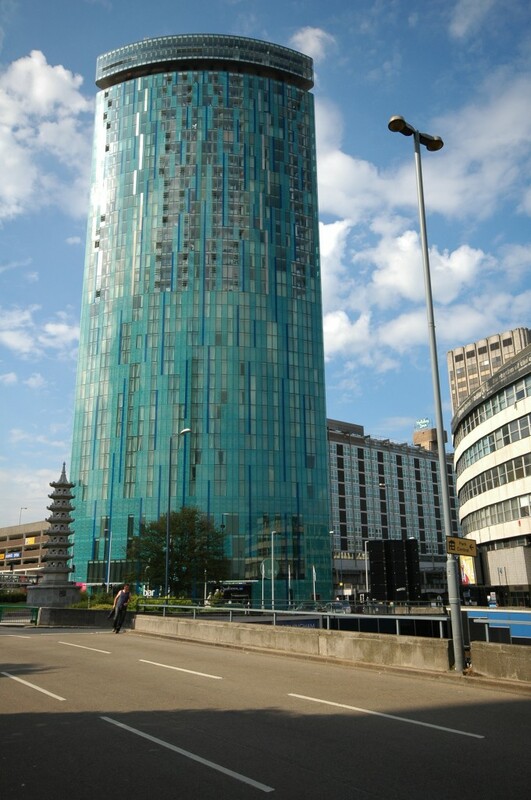 They have an in house café, outdoor terraces (which are called “secret gardens”) on the 3rd and 7th floors and the 9th floor has an indoor Skyline Viewpoint, something which offers some of the best views to be found are Brum’s busy city centre. More often then not the venue is booked up for private events, so be sure to check that it’s free before waiting for the lift (or if your brave/crazy enough, tackling the endless amount of stairs). The Council has set a target of 3 million visitors in the first year of the Library’s opening, and we surely must be well on the way of meeting this target having attracted the attention of visitors worldwide. If you’re in Birmingham then it’s definitely worth a look. You can join the library regardless of where you live, so be sure to join at your heart’s content. Victoria Square plays a vital role in linking the shops of New Street and the Bullring to the restaurants and bars of Brindley Place, doing so via a pedestrianised sense of class. It has to be one of the finest squares in the country, though naturally it isn’t in the same league as some Plazas and Piazzas in Europe. 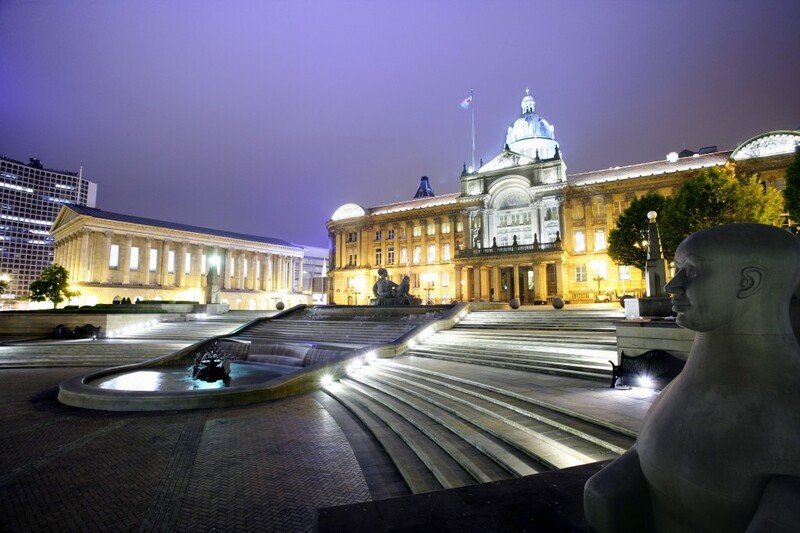 It happily boasts the Council House, Birmingham Museum and Gallery (BMAG) and the Birmingham Town Hall, displaying statues of Queen Victoria, the ever famous water feature The River (better known to Brummies as The Floozie in the Jacuzzi) and the “Iron Man” by Anthony Gormley. The biggest thing missing in the square is maybe bars with outdoor seating to match the wonderfully picturesque air of the Birmingham square. Maybe it has something to do with our wonderful licensing laws in the UK (sarcasm), but currently all that’s available is a stroll around the square, sitting by the fountain and people watching as they go about their daily business (not that we do is… much). Possibly the most famous part of the square is the annual German Christmas Market – the biggest German Christmas market outside it’s homeland and Austria – so be sure to get yourself some German cuisine, Christmas hats and festive cheer. Staggeringly, September 2013 marked the 10th anniversary of the famous Bullring (we remember when the plans were proposed for the Bullring, so to pass ten years is crazy). The premier indoor shopping centre boasts the usual high street names and little independent stores, but it’s the outside architecture that makes the Bullring so unique – the exterior of Selfridges is covered with no more than 15,000 silver discs, making the building beautiful in the blaring sun and in the cold dark of night, with lights illuminating it’s wonderful exterior. 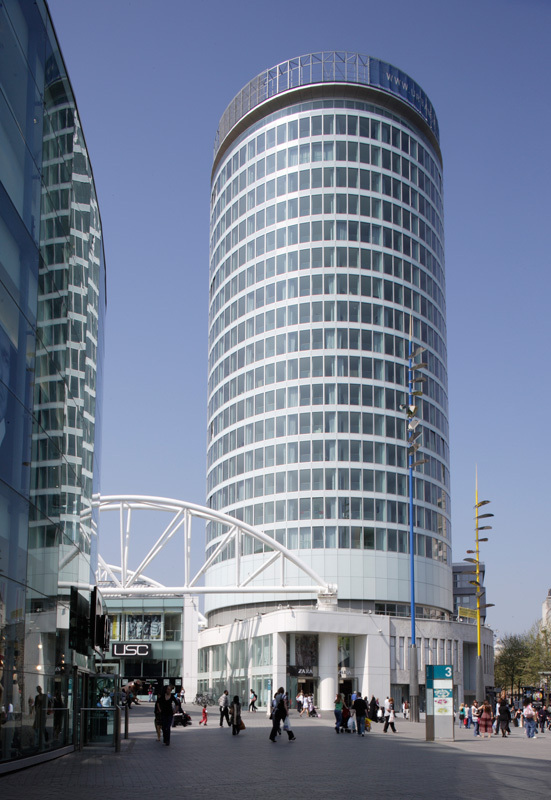 The Birmingham Rotunda, a grade II listed building, was originally constructed in the 1960s, yet it was given a makeover in 2008 to bring it up to date. Once used as an office block, it now consists of ‘serviced apartments’, with rooms and penthouse suites on the top floors being available to rent out nightly. The panoramic views that the Rotunda boasts are pretty amazing, especially in the heart of the city. There used to be a pub on the ground floor of the Rotunda , The Mulberry Bush, yet this was targeted as one of the two boozers by the IRA in the infamous Birmingham Pub Bombings. The other, The Tavern in the Town, is now an all you can eat buffet restaurant on New Street. The tallest building in the city, standing at 130m tall, homes a hotel/residential building. The BT Tower is taller, but this is classed as a tower rather than a building. The lower floors of the building are taken up by a branch of Radisson Blu hotel and restaurant (incredibly posh and expensive), with the upper floors homing serviced apartments. Birmingham is an incredibly dynamic city; it’s changing all of the time. There are numerous cranes on the skyline wherever you are, so it’s always a constant reminder that we’re growing, progressing, building. Hopefully we’ll be seeing more iconic buildings very, very soon. New Street stations is undergoing a massive regeneration period which will see the aged shopping centre turn into that of ‘Grand Central Birmingham’, a complete shopping experience with John Lewis sitting at the heart of the structure. Be sure to check it out in Autumn 2014 when it’s complete. Click here to browse some of our personal architectural structures in Birmingham.